Now that artemisinin derivatives in combination with partner drugs (artemisinin combination therapy (ACT)) are being used, parasitological confirmation has become essential before treatment in routine malaria case management, in most countries endemic for malaria[1, 2]. This ensures that anti-malarial drugs are only administered to patients who need them, thereby limiting the unnecessary use of inappropriate treatments. It also minimizes the selection and spread of drug-resistant Plasmodium falciparum parasites, particularly important in areas where multidrug resistance is prevalent, such as Southeast Asia[4–7]. Microscopic examination of blood films still remains the gold standard for malaria diagnosis despite the requirement for high-quality microscopes and equipment, and for qualified personnel. However, over the past two decades, rapid diagnostic tests (RDTs) for malaria have been developed for use in any situation where the only realistic alternative was clinical diagnosis of malaria, for example, at community level (e g, Village Malaria Workers’ strategy in Cambodia). These diagnostic tests are fast and easy to use, and do not require electricity or complex equipment. RDTs are now available from around 60 manufacturers. This profusion of suppliers and the variable quality of RDT products marketed have made it difficult for the policy makers of national malaria control programmes to determine which tests are the most suitable. To address this issue, a global evaluation programme to guide RDT procurement (product testing) and assure RDT performance before and during use in the field (lot testing) was launched in 2002 by the WHO Regional Office of the Western Pacific (WPRO), in collaboration with the WHO/Global Malaria Programme, WHO/GMP), the UNICEF/UNDP/World Bank/WHO Special Programme for Research and Training in Tropical Diseases (TDR), the Foundation for Innovative New Diagnostics (FIND), the Centers for Disease Control and Prevention (CDC, Atlanta) and numerous other partners. The malaria RDTs available are all based on the same principle and like other lateral flow immune-chromatographic tests, there are various formats (dipstick, plastic cassette or card). They contain antibodies conjugated to colloidal gold particles, which bind specifically with parasite antigens. Some of them are specific for P. falciparum and detect the histidine-rich-2 protein (HRP-2). Others combine HRP-2 detection with the detection of antigens common to all species, such as lactate dehydrogenase or aldolase (combo RDTs). Combo RDTs can diagnose infections by P. falciparum or by non-P. falciparum malaria parasites (Plasmodium vivax, Plasmodium ovale and Plasmodium malariae). IMACCESS© is a company which aims to address public health requirements by developing reliable diagnostic tools responding to the constraints associated with use in the field for populations in developing countries at affordable prices. The company recently developed VIKIA Malaria Ag Pf/Pan™, a new malaria test. This new RDT, based on the same technology as other tests, allows detection of falciparum malaria (HRP-2) and non-falciparum malaria (aldolase). In this context, the objective of the study presented here was to assess the performances of this new immunochromatographic test by following a conventional field evaluation design including microscopic examination (thick and thin blood film) and molecular detection (real-time PCR) as gold standard methods for malaria diagnosis of febrile, malaria-suspected patients seen at health centre level. In addition, the VIKIA Malaria Ag Pf/Pan™ test was also compared to another RDT widely used in Cambodia and elsewhere (CareStart Malaria™, AccessBio®). 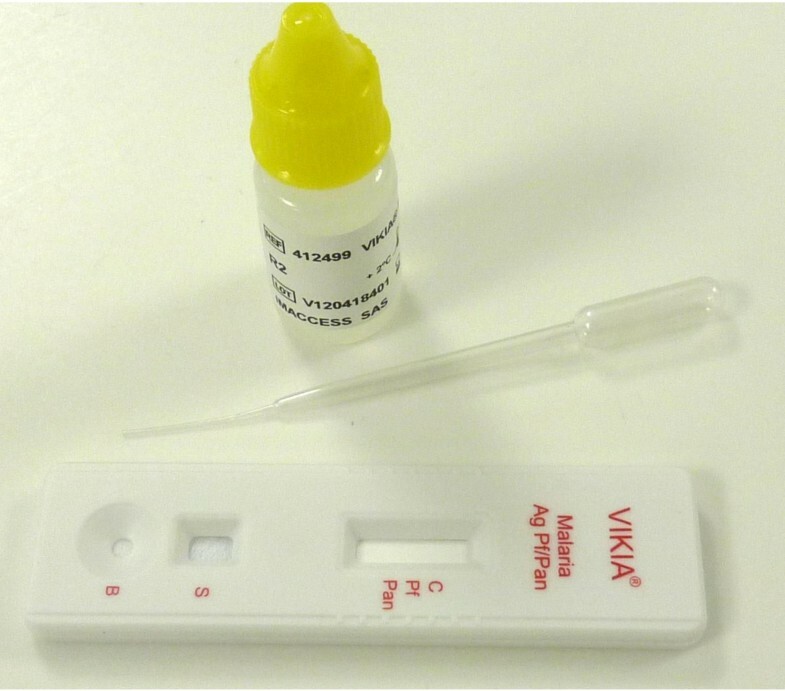 The VIKIA Malaria Ag Pf/Pan™ test kit (IMACCESS©, Ref. 41 2499, Lot Number: V110727601, Lyon, France), containing one package insert, 25 test cassettes in individual sealed pouches with a disposable specimen pipette and a dessicant and one vial of running lysis buffer, was used according to the manufacturer’s instructions. Briefly, a 5 μL aliquot of blood drawn from patients was added to the sample well. Five drops of lysis buffer were then dispensed into the buffer well (Figure1). Results from the test were interpreted at several times (readings after 10, 15, 20, 30 and 60 min). In parallel, the CareStart Malaria™ test (Access Bio©, Ref. G0131, Lot Number: J191R, New Jersey, USA) was also performed according to the manufacturer’s instructions and used to diagnose patients as malaria infected. Design of the VIKIA Malaria Ag Pf/Pan™ test. 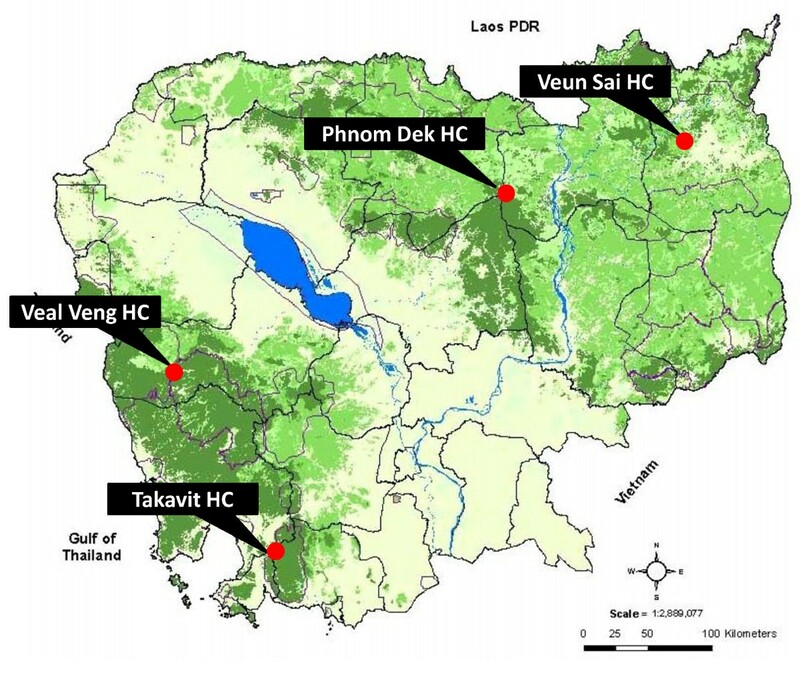 Four different sites in Cambodia, all members of the anti-malarial drug-resistance network (collaboration between the Ministry of Health and the Institut Pasteur du Cambodge) were selected (Figure2): Veal Veng health centre (in Pursat province), Veun Sai health centre (in Rattanakiri province), Phnom Dek health centre (in Preah Vihear province) and Takavit health centre (in Sihanoukville province). Map of Cambodia with the locations of the four selected health centres indicated. Malaria remains a public health problem at these sites, and is mainly linked to the forests. Forest villagers in the eastern and northern provinces are at high risk of malaria, whereas elsewhere in the country malaria is an occupational disease with particular groups being at high risk, including forestry workers, new settlers and mobile/migrant populations moving into forested areas, and soldiers and their families serving in the forests. The prevalence is between 15% and 40% in villages near or in forested areas, and between 0% and 3% in the plains and rice field areas. The five human Plasmodium species all co-exist in the Cambodia and P. falciparum is the most frequent cause of malaria infections (prevalence ~70%). The distributions of Plasmodium species have been changing over recent years, with a particularly significant increase in the incidence of P. vivax malaria cases (from 8% in 2000 to 23% in 2007). In low transmission areas, a proportion of infections that are P. vivax is commonly up to 50%[15–19]. In the four sites, patients with clinical symptoms of malaria (fever ≥37.5°C) and with a prescription for malaria diagnosis from a health care worker, agreeing to be enrolled in the study (by signing the consent form), were included. Pregnant women and patients with signs of severe and complicated P. falciparum malaria according to the definition of the World Health Organization (2001) were excluded. The study protocol was reviewed and approved by the Ethics Committee of the Cambodian Ministry of Health (No. 075 NECHR, 21 June, 2011). Blood samples were collected by finger-prick and used for malaria testing (both RDTs were tested in parallel by two health staff blinded to each other). In addition, two drops of blood were spotted onto Whatman 3 M filter paper™ and individually stored in an envelope and a plastic bag. Slides for thick and thin microscopic examination were also prepared, and stored in appropriate boxes. Clinical and biological information were recorded on an anonymous form to ensure patient confidentiality. Filter papers and slide boxes were sent to the Institut Pasteur du Cambodge (IPC) in Phnom Penh every week. At IPC, thick and thin blood smears were stained with 3% Giemsa for 30 min and analysed by light microscopy by two experienced technicians without reference to RDT results. A minimum of 200 consecutive fields was checked in the thick blood film before classifying a slide as negative. Parasites in thick blood films were counted against 200 white blood cells. The parasite density was estimated assuming 8,000 white blood cells/μL of blood. One in 10 slides selected at random, and all slides corresponding to discordance between the first two readings, were read a third time by a third expert microscopist. DNA was extracted from blood spots with Instagene Matrix resin™ (Bio-Rad©, Marnes la Coquette, France), according to the manufacturer’s instructions. Molecular detection and identification of Plasmodium parasites involved two steps: Plasmodium was detected by a “screening real-time PCR” with primers targeting the Plasmodium cytochrome b gene. Secondly, DNA samples identified as positive for Plasmodium were analysed for malaria species by PCR with several pairs of specific primers (P. falciparum, P. vivax/ Plasmodium knowlesi, P. malariae and P. ovale) targeting the same gene (Table1). Molecular analyses were performed by technicians blind to the results of microscopic and RDT diagnoses. From 68 to 90°C, increment 0.2°C for 0.05 sec. Hot FirePol DNA Pol. Solis BioDyne 1.25 U (#01-02-01000), dNTP 200 μM, MgCl2 2.5 mM, Primers 250 nM, 5 μl DNA template. Total volume 20 μl. 94°C −15 min. 20 cycles: 94°C-30 sec/ 58°C -1 min/ 72°C-1 min3. 72°C-10 min. From 65 to 90°C, increment 0.2°C for 0.05 sec. Data were entered, processed, and analysed using Microsoft Excel 2010 software. The chi-squared test was used to compare the performances of the different diagnostic methods used (real-time PCR, microscopy and RDTs). P- values <0.05 indicated statistically significant differences. For sensitivity and specificity, RDT results were compared with microscopy and real-time PCR results. Sensitivity was calculated as the proportion of positive test results obtained among samples containing malaria parasites as identified by microscopy or real-time PCR. Specificity was calculated as the proportion of negative test results among samples scoring negative by thick blood film or real-time PCR tests. Positive and negative predictive values were the proportion of true-positive results among all positive samples and the proportion of true negative results among all negative samples, respectively. From August to December 2011, 1,000 patients (Preah Vihear, N = 300, Veal Veng, N = 250, Ratanakiri, N = 300 and Takavit, N = 150) with an age range of one to 70 years (mean ± SD age = 22.4 ± 12.9 years; 7.0% <5 years of age, 18.0% between five and 14 years of age, and 75.0% >15 years of age) were recruited. The male/female ratio was 2.1/1. The mean ± SD axillary temperature was 38.1 ± 0.9°C (range = 37.5–41.5°C) and the mean ± SD parasitaemia density was 13,455 ± 52,694 parasites/μL (range = 20–582,500 parasites/μL). Microscopy results showed that 389 (38.9%) of the 1,000 patients had malaria. Plasmodium falciparum was present in 39.5%, P. vivax in 58.8% and both P. falciparum and P. vivax (mixed infections) in 1.5% of the positive specimens. 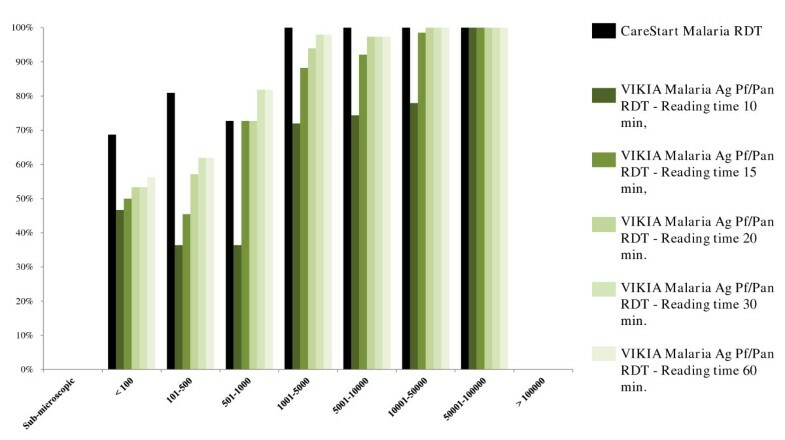 A total of 92 discordant results (9.2%) were found between microscopy and real-time PCR (Table2). Some 32 cases (3.2%) classified as negative by microscopy were positive by real-time PCR (sub-microscopic parasitaemia: six P. falciparum, six mixed P. falciparum/P. vivax and 21 P. vivax). In addition, 59 samples were misclassified by microscopy: 54 were classified as single infections by microscopy (43 P. falciparum, 11 P. vivax) but found to be mixed infections by real-time PCR (52 mixed P. falciparum/P. vivax and two mixed P. vivax/P. malariae); three cases classified as mixed P. falciparum/P. vivax infections were identified as single P. falciparum infections by real-time PCR; two cases classified as single P. vivax infections were found to be single P. falciparum infections by real-time PCR. Details concerning patients positive for Plasmodium spp. by real-time PCR, microscopy, CareStart Malaria™ and VIKIA Malaria Ag Pf/Pan™ tests at several reading times (10, 15, 20, 30 and 60 min) are shown in Table3. Frequencies of false positives, false negatives and misclassified results obtained from RDTs with reference to microscopy and PCR results (including non-interpretable data; Table4) indicated that the best reading times were 20–30 min for the VIKIA Malaria Ag Pf/Pan™ test. Diagnostic performances of both RDTs are shown in Table5 and Figure3. Sensitivities for different levels of Plasmodium spp. parasitaemia are summarized in Table6, Figure4 for P. falciparum infections and Figure5 for non-P. falciparum infections. Patients scoring positive for Plasmodium spp. by the reference method (microscopy/PCR), CareStart Malaria™ test and VIKIA Malaria Ag Pf/Pan™ test at several reading times (10, 15, 20, 30 and 60 minutes), Cambodia, 2011. VIKIA Malaria Ag Pf/Pan RDT - Reading time 10 min. VIKIA Malaria Ag Pf/Pan RDT - Reading time 15 min. VIKIA Malaria Ag Pf/Pan RDT - Reading time 20 min. VIKIA Malaria Ag Pf/Pan RDT - Reading time 30 min. VIKIA Malaria Ag Pf/Pan RDT - Reading time 60 min. Pf: P. falciparum; Pv: Plasmodium vivax; Pm: Plasmodium malariae; Non-Pf: Plasmodium non-falciparum. Pf: P. falciparum; Non-Pf: Plasmodium non-falciparum. PPV: Positive predictive value; NPV: Negative predictive value. Comparative representation of the diagnostic performances of the CareStart Malaria™ test and the VIKIA Malaria Ag Pf/Pan™ test at several reading times (10, 15, 20, 30 and 60 minutes) for detection of Plasmodium spp. in field study patients, Cambodia, 2011. Comparative representation of the sensitivities of the CareStart Malaria™ test and the VIKIA Malaria Ag Pf/Pan™ test at several reading times (10, 15, 20, 30 and 60 minutes) for different levels of Plasmodium spp. parasitaemia. Results for Plasmodium falciparum infections, Cambodia, 2011. 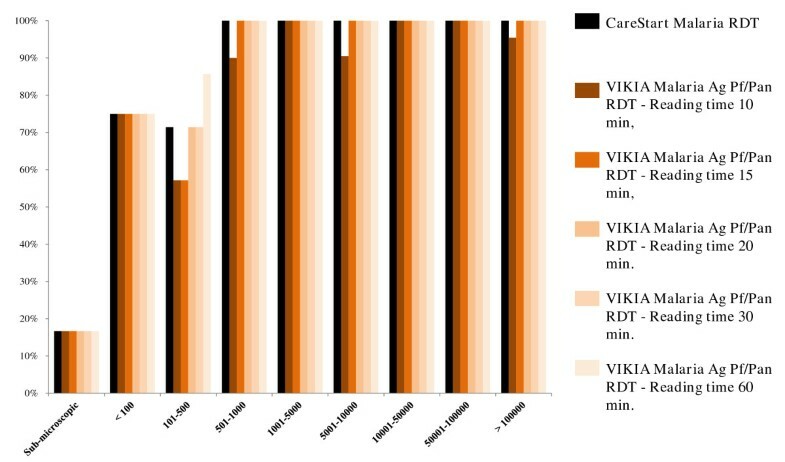 Comparative representation of the sensitivities of the CareStart Malaria™ test and the VIKIA Malaria Ag Pf/Pan™ test at several reading times (10, 15, 20, 30 and 60 minutes) for different levels of Plasmodium spp. parasitaemia. Results for non-P. falciparum infections, Cambodia, 2011. This study reports the first evaluation of the performance of the VIKIA Malaria Ag Pf/Pan™, a new immunochromatographic test developed by IMACCESS®, using a combination of microscopy and real-time PCR as reference methods for classification of samples. This approach had the advantage of combining the high sensitivity (especially at low parasite density) and specificity (to correctly identify the parasite species) of real-time PCR, with the possibility of estimating parasite density by microscopy. As expected, more positive samples were found using real-time PCR than microscopy (+ 8.5%, 38.9% vs 42.2%), CareStart Malaria™ test (+9.7%, 38.1% vs 42.2%) or VIKIA Malaria Ag Pf/Pan™ test (from +10.4% for 60 min reading time to +27.0% for 10 min reading time, 30.8% and 37.8%, respectively vs 42.2%). A similar trend was also found for a greater sensitivity of microscopy by expert microscopists than malaria RDTs: 2.0% more positive samples by microscopy than CareStart Malaria™ test (38.8% vs 38.1%) and 2.8% (60 min reading time) to 20.8% (10 min reading time) more than with the VIKIA Malaria Ag Pf/Pan™ test (38.8% vs 37.8% and 30.8%, respectively). 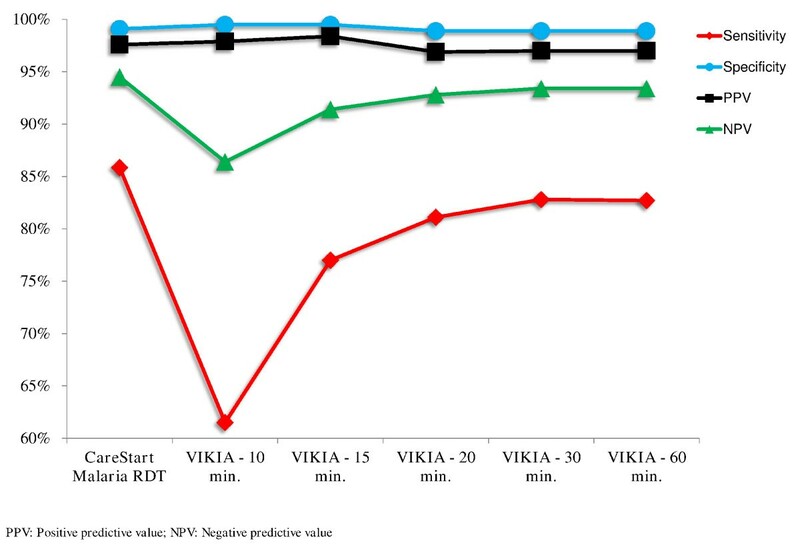 The sensitivity (and the frequency of false negatives) of the VIKIA Malaria Ag Pf/Pan™ test increased with reading time, from 89.7% for P. falciparum detection and 61.5% for non-P. falciparum detection (10 min) to 94.2% for P. falciparum detection and 82.7% for non-P. falciparum detection (60 min). The specificity (and the frequency of false positives) decreased with reading time from 99.3% for P. falciparum detection and 99.5% for non-P. falciparum detection (10 min) to 98.1% for P. falciparum detection and 98.9% for non-P. falciparum detection (60 min). The best performances of the VIKIA Malaria Ag Pf/Pan™ test for both P. falciparum and non-P. falciparum detection were observed at 20–30 min (sensitivity: 93.4% for P. falciparum and 81.1%-82.8% for non-P. falciparum; specificity: 98.6% for P. falciparum and 98.9% for non-P. falciparum). Using these reading times, the performance of the VIKIA Malaria Ag Pf/Pan™ test was similar to those of the CareStart Malaria™ test or those found in previous studies[21–26]. Moreover, as has been previously reported, the sensitivities of both malaria RDT decreased with the level of the parasitaemia[23, 26–30]: for P. falciparum, the sensitivity of the both tests started to decrease at levels of parasitaemia < 500 parasites/μL (100% above 500 parasites/μL) and for non-P. falciparum, the sensitivity of the CareStart Malaria™ test and the VIKIA Malaria Ag Pf/Pan™ test started to decrease below 1,000 parasites/μL or below 10,000 parasites/μL, respectively. False negative results for both malaria RDT were only found in P. falciparum samples containing <250 parasites/μL and in non-P. falciparum samples with <1,000 parasites/μL. According to WHO recommendations for RDT performances, sensitivity of the VIKIA Malaria Ag Pf/Pan™ test (except when the time reading was 10 min) was greater than 95%, excluding samples with a parasitaemia <100 parasites/μL. As observed for the CareStart Malaria™ test, the VIKIA Malaria Ag Pf/Pan™ test was easy to use and interpret and simple to store with no cold chain requirement. In conclusion, this new RDT performs similarly well as other commercially available tests (and in particular the CareStart Malaria™ test, used as comparator), and conforms to WHO recommendations for RDT performance. It appears to be a satisfactory alternative tool for the diagnosis of malaria in endemic areas. We thank everyone at Veal Veng, Veun Sai, Phnom Dek and Takavit health centres for participating in the study. We also thank all the health workers and the staff of the Ministry of Health of Cambodia and the National Center for Parasitology, Entomology and Malaria Control for their collaboration. We are grateful to Marc Leportier, Catherine Ratat and Anne Bertrand-Pinault from IMACCESS for providing VIKIA Malaria Ag Pf/Pan™ test kits and for their constructive advice. We also thank Prof Stéphane Picot from Lyon Malaria Research Unit for sending blood spots used for checking the quality of the real-time PCR. This study was supported by IMACCESS. The fund providers had no role in data collection and analysis, decision to publish, or preparation of the manuscript. Didier Ménard is supported by the French Ministry of Foreign Affairs.